(Bloomberg) -- There is a complacency haunting foreign-exchange markets. Measures of how much traders expect currencies to gyrate over the coming months have plunged amid apparent assurances from central banks that they aren’t going to create major waves with further policy normalization anytime soon. 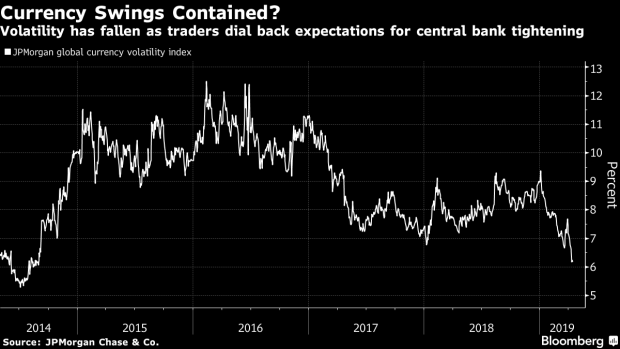 But some observers, including strategists at Canadian Imperial Bank of Commerce, Morgan Stanley and Scotiabank are raising warning flags about the lack of volatility. --With assistance from Joanna Ossinger.